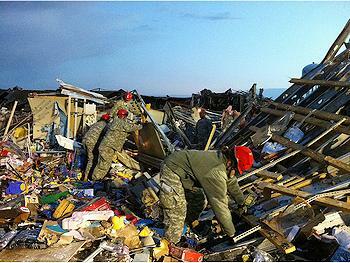 JOPLIN, Missouri, May 23, 2011 (ENS) – At least 89 people lost their lives to a giant tornado that spun across a six-mile strip of southwestern Missouri about 6 pm on Sunday, and officials say the death toll could still rise. 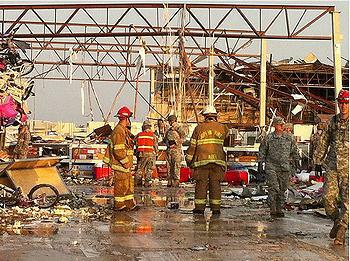 The twister devastated Joplin, a city of 50,000 people, leaving close to a quarter of the city in ruins. A hospital, a nursing home, two fire stations and entire residential neighborhoods were destroyed on the south side of Joplin, located 160 miles south of Kansas City. The hospital, St. John’s Regional Medical Center, is being evacuated amidst reports that oxygen and combined fuels may cause an explosion. As a thunderstorm with strong winds and heavy rain and hail cracked across parts of the city this morning, search and rescue workers continued to comb the wreckage for survivors. Joplin Mayor Mike Woolston has declared a local disaster due to the damage of this storm. The city is also working under a state disaster declaration. Jasper County emergency management director Keith Stammer told reporters about 2,000 buildings were damaged, including his own home. USAR Missouri Task Force 1 has been deployed to assist with search and rescue efforts. A division of the Boone County Fire Protection District that specializes in search and rescue operation in building collapses, the task force uses state of the art search equipment, including visual and acoustical devices, medical equipment and K-9 search teams using specially trained dogs. The state has also requested search and rescue teams from Kansas, Arkansas and Oklahoma through the Emergency Management Assistance Compact. Missouri Governor Jay Nixon activated the Missouri National Guard Sunday evening. “I have ordered the Missouri National Guard to deploy citizen-soldiers and assets to support local law enforcement agencies with emergency coordination and recovery, and other state assets have been mobilized to provide emergency support as well,” the governor said. President Barack Obama took time from his visit to Ireland to extend federal assistance to the Missouri governor. The President received multiple updates on the tornado damage throughout the course of the flight from Washington to Dublin last night. He instructed his staff to keep him updated and to stay closely coordinated with state and local officials going forward. Missourians who need disaster information, shelter information or referrals are urged to call 211. The Greater Ozarks Chapter of the Red Cross has established a shelter for people and their pets at Missouri Southern State College in Joplin. Missourians interested in volunteering to assist should call 800-427-4626 or 211. Those with medical skills interested in volunteering can go to: https://www.showmeresponse.org/. Joplin Municipal Court and Joplin Public Schools are closed due to tornado damage. The City and Joplin R-8 are coordinating transportation to help those left homeless due to tornado. People can go to the following locations and a bus will take them to the shelter. People should go to: Junge Stadium on 13th Street; Forest Park Baptist Church, 7th & Range Line; Lowe’s 24th & Range Line; or Vintage Stock, 32nd & Main. In Kansas, there were reports of 14 tornado touchdowns with damaging winds and hail statewide on Saturday night. Kansas Governor Sam Brownback declared a state of emergency for 16 counties. “This state declaration paves the way for the state to assist the counties with resources and to seek federal assistance if the damages qualify,” said Brownback. The city of Reading, Kansas, population 231, in Lyon County was hardest hit by tornado damage. At least 20 homes were destroyed, 200 homes were damaged and Reading is without power. One person was killed and five others were injured. An Incident Command Post has been established in Reading. A tornado struck the capital Topeka, but no injuries were reported. Shawnee County emergency management officials reported significant hail damage throughout the county including broken windows and tree limbs. 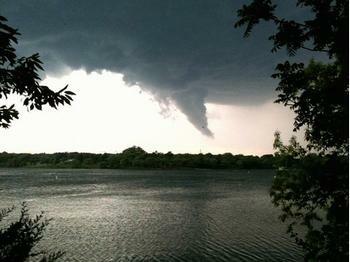 In Minnesota, there were multiple reports of tornado touchdowns in Washington County. There are downed trees and power lines and 20,000 customers are without power. No fatalities have been reported but there are multiple injuries. In Wisconsin, there are reports of over 200 homes damaged in the La Crosse area. The state is performing damage assessments.